An unconventional exploration of thematic structure and positioning of the Audience. A wonderfully acted film that falls two notches shy of telling a complete story. While “Doubt” is clearly the topic of discussion, it is only within the final scene that we truly discover what the film is really about. When you’re wrong with Dramatica, you’re wrong in a big way. 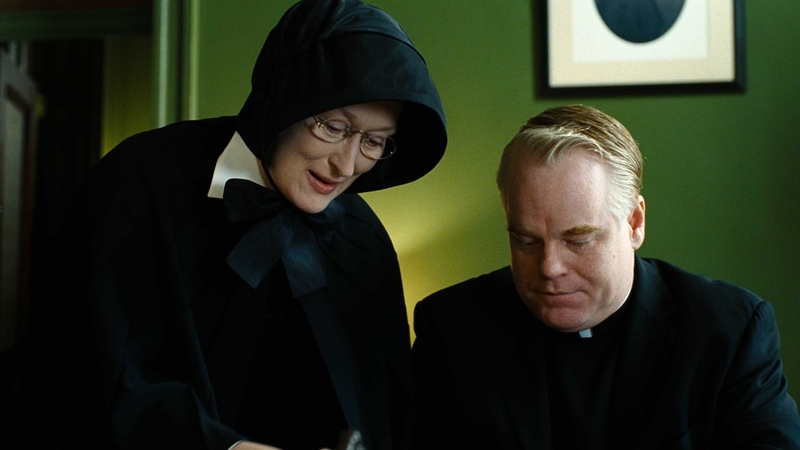 We find out what the film is really about from the first scene: Father Flynn’s (Phillip Seymour Hoffman) appeal to his congregation to consider themselves brothers in not knowing the truth is to impact through manipulation, coerce by gently positing new ways of thinking, and motivate by means of proactively attacking any negative reactions to his behavior (Influence Character Throughline of Manipulation, Influence Character Concern of Conceiving, Influence Character Response of Proaction and Symptom of Reaction). His second sermon concerning the evils of gossip challenges both congregation–and specifically Main Character Sister Alloysius–to use deductive reasoning to project the fallout from “loose ships” (Influence Character Problem of Deduction). From her perspective Sister Alloysius (Meryl Streep) finds Flynn’s activities suspicious and her crusade to find out what is going on behind closed doors ends up opening a door of her own she never expected (Main Character Throughline of Activity, Main Character Concern of Learning). By acclimating herself to the modern world through such conveniences like a transistor radio, Alloysius grows from a widow of strict faith to one stricken with doubt (Main Character Growth of Start, Main Character Problem of Certainty, Main Character Resolve of Changed, Main Character Solution of Potentiality). The tears in the garden at the end suggest an absence of peace and the understanding that her actions may very well have opened up the potential for Flynn to abuse more children at a different parish (Story Judgment of Bad, Story Driver of Action). Flynn escapes scott free–not a single soul at the parish considering him guilty. Even Sidekick Sister James (Amy Adams), Alloysius’ primary ally, no longer feel driven to investigate the matter further (Story Consequence of the Present, Story Outcome of Failure, Story Goal of Contemplations, Overall Story Issue of Investigation). Alloysius’ encounter with mother Mrs. Miller (Viola Davis) foretells of the inevitable. The unspoken understanding driving her to balance the reaction of her son’s father cements the uncertainty over the inappropriateness of Father Flynn’s behavior (Story Forewarnings of Understanding, Overall Story Symptom of Reaction, Overall Story Problem of Certainty, Overall Story Throughline of Fixed Attitude). The struggle in the relationship between Alloysius and Flynn stems from the hierarchy of power between Priest and Nun (Relationship Story Throughline of Situation). Who sits where in whose office and the agreed upon role of each within the community stokes a conflict that seems to have persisted theoughout the Church’s history (Relationship Story Concern on the Present, Relationship Story Issue of Work, Relationship Story Benchmark of the Past). Inferring one’s role within the system to be out of line warrants quick reprimands that only deepen the distrust between them (Relationship Story Symptom of Induction, Relationship Story Response of Deduction). With only doubt and certainty bandied about, the story feels light and the argument one-sided. Upon further investigation, the certainty with which we first delivered our initial analysis appears to have clouded our judgment. Doubt provides a compelling and effective argument against standing for one’s convictions. Damned if you do, damned if you don’t–when dealing with matters of Faith the potential for an emotional downfall seems inevitable.